A great weekend for football!!!! 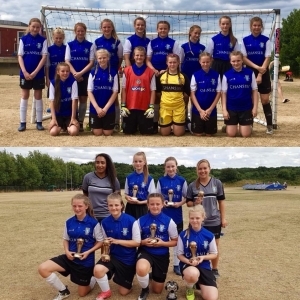 On Saturday our U10’s, U14’s, U15’s & U16’s (last years age groups) entered various teams on a very hot day. Everyone put in some great performances but it was our U14’s who stole the day winning their age group. Our U12’s entered 2 teams who met in the semifinals ensuring a Wednesday team in the final to face Gedling. The game ended in penalties with our girls victorious and lifting the trophy. The U13’s also entered 2 teams and both teams did really well with one making it to the final to face Sheff Utd. Our girls won without the need for penalties. Finally our senior section entered 4 teams with our 2 young development teams doing really well but just missing out on the semifinals. Our Reserve team also had a great day and only lost 1 game all day, but 1 too many draws meant they also just missed out on the knockout stages. Over to the 1st team who won their group with a young Sheff Utd team coming 2nd on goal difference, and we then went on to beat Steel City in the semi final, before facing Rovers Foundation in the final. The girls led 1-0 until the last kick of normal time when Rovers scored to force extra time. The game ended in penalties with our girls going out on the final penalty.